A little more than a year ago I was making frequent visits to both the Blackfoot Indian Reservation in south eastern Idaho and the Windriver Reservation just north of Lander, Wyoming. I became quite well acquainted with many of the reservation Indians and spent hours in conversation with them. I had the chance to travel around the reservations and got to know the general lay of the land of both. Having grown up in Idaho, it was always a source of pride that Sacajewa, a Shoshone was from my home state. What I learned during my time among the Shoshone on two reservations was that she was ultimately buried in the cemetary on the Windriver Reservation. I have visited her grave on several occasions and though some dispute its authenticity, I do not. It is located near to the monument to her son Jean Baptiste Charbonneau, who was the papoose born at the beginning of the expedition led by Lewis and Clark known as the "Corps of Discovery." Sacajewa carried her infant child all the way to the Pacific shore near the mouth of the Columbia River, where she picked up a sand dollar as a souvenir (later given to Chief Washakie and proudly worn in photos - follow link to see). 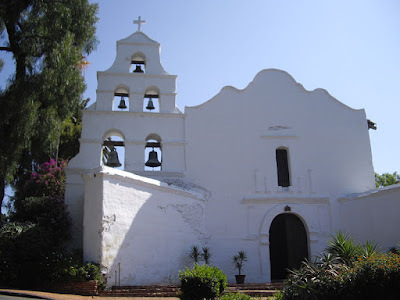 During Jean Baptiste's adult life, he was chosen to guide the Mormon Battalion to the Pacific coast at San Diego, where they ultimately arrived at or near the Mision San Diego de Alcalá 164 years ago today on January 29, 1847 (Alcalá means "the castle" in Spanish, taken from Arabic). The papoose engraven on the Sacajewa dollar made it to the pacific shores of our country at least twice - once during the Jeffersonian age of discovery and again during the age of Manifest Destiny that pushed our borders to the Pacific Ocean. So - that is a long and involved introduction to this short but complex poem; without which it wouldn't make much sense. I visited the Mision de Alcalá as a small boy and remain impressed with its ancient grandeur - which changed jurisdiction from Mexican to American. The arrival of Sacajewa's son signaled the end of an era and the beginning of a new one. Walked to the sea that mid-winter morning of spring. Stood silent as they gazed at the sea. And silenced their ancient ring. Walked the shores of America that mid-winter morning of spring.